All tours are led by trained guides. Frank Lloyd Wright used his first home to experiment with design concepts that contain the seeds of his architectural philosophy. In his adjacent studio, Wright and his associates developed a new American architecture - the Prairie style. Trained interpreters offer insights into Wright's family life and architectural career. Oak Park is home to the world's largest collection of Wright-designed buildings. 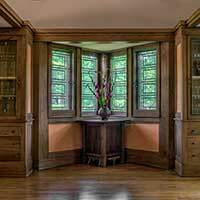 Discover the development of Wright's style between 1889 and 1909, and trace the evolution of American residential architecture as trained interpreters guide you through the Frank Lloyd Wright Historic District surrounding the Home and Studio. Tour length: 60 minutes (guided); 45 minutes (self-guided). Explore the architectural delights of Oak Park and River Forest from the comfort of your motorcoach. 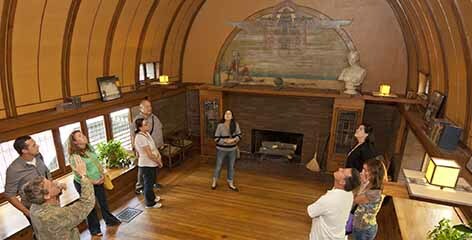 Our expert guide joins your coach group at the Home and Studio to offer a tour of historic Oak Park and River Forest, featuring structures designed by Frank Lloyd Wright and his contemporaries. Unity Temple announced a new era of innovation in modern architecture when it was built. 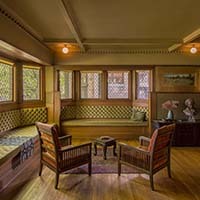 This National Historic Landmark, exemplifying Wright’s theory of organic design, is once again open to the public after completion of a comprehensive restoration. Tours available Monday - Friday. Limited availability on Saturday. 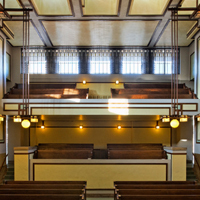 Your group may also tour Unity Temple on its own. We provide a written guide for each visitor. Frank Lloyd Wright's Robie House is both a masterpiece of the Prairie style and an icon of modern architecture. Trained interpreters offer insights into the amazingly contemporary spaces Wright designed over a hundred years ago. Tours available Thursday – Monday. An architectural masterpiece is the venue and you are on the guest list. 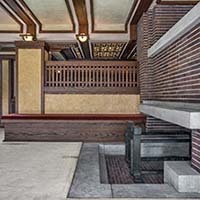 Gather with friends as the Robie House comes to life at twilight. Discover the celebrated spaces of Wright’s renowned masterpiece of modernism while enjoying drinks, light hors d’oeuvres, and a festive, casual atmosphere. The Robie House may be reserved by professors and educators for a class lecture, tour, sketching session, or other educational activity. Must be prearranged through Group Tours. Available Tuesdays and Wednesdays only. Book the Robie House as the venue for your next event. Set in the heart of Chicago’s financial district, Daniel Burnham and John Root’s 1888 Rookery Building is a Chicago landmark, containing one of Frank Lloyd Wright’s most dramatic interior compositions – a luminous and brilliantly articulated central light court. 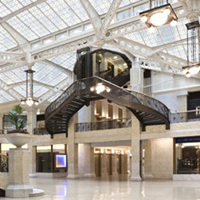 In 1905, Wright was commissioned to remodel the Rookery light court and lobbies. He realized a stunning balance between Burnham & Root’s ornamental ironwork and his own vision to create a spectacular environment. The Burnham Library is not available for group tours. Tours available Monday – Friday. 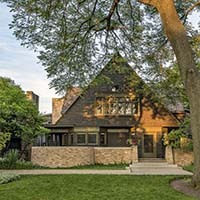 This richly conceived yet intimately scaled residence was built in 1915 for Emil Bach, president of Chicago’s Bach Brick Co. A modification of Wright’s design for “A Fireproof House for $5000,” published in Ladies Home Journal in 1907, the Bach House was executed between Wright’s return from Europe in 1911 and his departure to Japan in 1916 to oversee construction of the Imperial Hotel. While adopting the vocabulary of Wright’s Prairie house, the Bach House looks toward future stylistic directions in Wright’s work, in its contained geometry, efficient scale, and distinctive window designs. 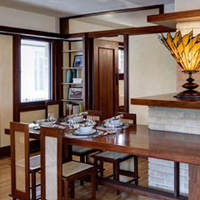 The Frank Lloyd Wright Trust’s internationally renowned annual architectural housewalk Wright Plus will be on Saturday, May 18, 2019, featuring rare interior tours of private homes and public buildings designed by Frank Lloyd Wright and his contemporaries. A truly unique experience for your group. Special group rates available. For further assistance call the Group Tour Manager at 312.994.4041.